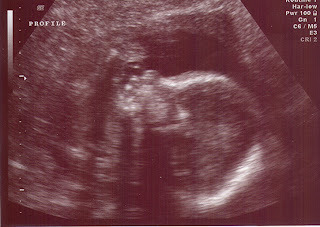 Bedrest Boutique: Baby Girl "Hershey"
Here are our latest ultrasound pictures. The middle picture is in the 3D format. It is pretty incredible. (those are the ones that celebrities pay big bucks for to see what their babies will look like). 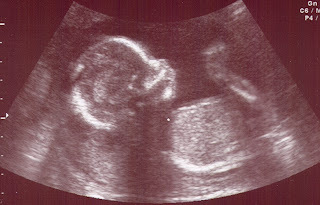 We didn't get to see the 3D images when Holland was born, it was only for high risk babies and assessment of developmental anamolies, etc. Now, it's standard practice (at least at my doctor's office). For those of you who don't know, Holland has named our baby girl. She calls her "hershey". 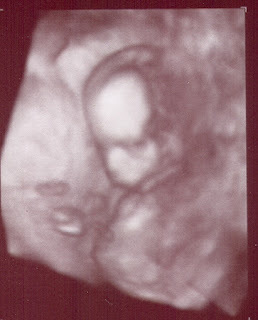 So for now, I think we will allow that to be her nickname, and we will have to break it to Holland that at some point we will probably call her something else! Hey, Miss Ash....Happy Valentine's Day! I started to call you the other day but realized I did not know what number to call...I promise to quit being lazy and call your house to find out. You have been in my thoughts and prayers! Yippee, Ashley! that blogging is pretty high tech, whew! and she looks just like you and Jonathan! hope yr doing much better, a belated happy birthday to Johnny and happy valentines! we're off tomorrow for Mccall idaho for a wedding of a pal of Karen's, though going through pendelton not spokane, but good luck, and i bet yr home soon! Those are super cool pics - Makes me feel that much closer to Hershey! Keep those whiz-bangy-thingys coming (heart beat, pics, etc.) I love them!